Salafi terrorists are not going to take power in Egypt. They are an irritant, but the political result of their activities is likely to be growing support for Sisi, and calls for harsher measures mirroring Hosni Mubarak's crackdown on similar groups in the 1990s. Shortly after the coup, the Muslim Brotherhood was declared an illegal organization and its assets seized. Leaders of the movement, including incumbent President Mohammed Morsy, were arrested. On August 14th, the army engaged in a bloody crackdown on the movement's sit-in at the Rabia Mosque in Cairo. Thus, a statement released to the press by Interior Minister General Mohammed Ibrahim after the Ismailiya attacks asserted that "The Muslim Brotherhood has a new source of funding, as is indicated by the attack on Monday morning against South Sinai Security Directorate using a booby-trapped vehicle driven by a suicide bomber." By turning to force, Egypt's Islamists would be 'playing' the security forces on the latters' home turf, with no hope of victory. But political activity is also closed to them. Other Islamist groups are struggling to come up with a response. The Gamaa al-Islamiya movement, a formerly terrorist group which entered politics after the toppling of Mubarak, expressed the Islamists' dilemma in the clearest way. Speaking to al-Ahram newspaper, one of its leaders said that after Mubarak's fall, they had 'became engaged in the political process. We made some mistakes, of course. Such is the nature of the political game. But now society wants to ban us. How are we supposed to persuade our youth not to engage in politics and not to turn to violence again?" The answer, from the point of the view of the present Egyptian authorities, is something like 'that's your problem.' 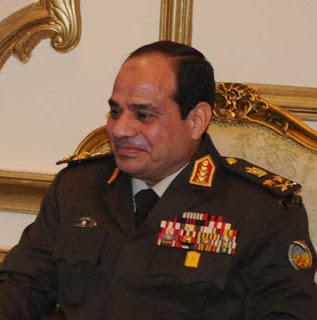 General Sisi's approach may appear unfamiliar to contemporary western observers because he is not seeking to hold the Islamists to a stalemate and then seek an accommodation. Rather, his goal appears to be strategic victory in his battle with the Muslim Brotherhood and the smaller Islamist factions. To this end, he is offering them two alternatives: accept political oblivion – or choose to resist it, and be destroyed by the army.